In addition to its 116 million ha of native eucalypt forest (ABARES 2011), Australia has 924,000 ha of eucalypt plantations (Gavran 2012), which is approximately 5% of the global estate (Iglesias-Trabado et al. 2009). The majority of the Australian eucalypt plantation estate was established between 1995 and 2009, an expansion that was mainly driven by managed investment schemes (Gavran and Parsons 2011), and most were established as pulpwood plantations (85% - Gavran 2012). Most of these eucalypt plantations are in southern, temperate regions of Australia, and Eucalyptus globulus Labill. (Tasmanian Blue Gum) and E. nitens (Deane & Maiden) Maiden (Shining Gum) are the main species grown (Table 1). Both species belong to the subgenus Symphyomyrtus, section Maidenaria (Brooker 2000). 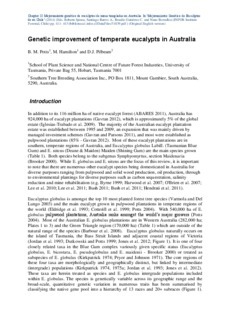 While E. globulus and E. nitens are the focus of this review, it is important to note that there are numerous other eucalypt species being domesticated in Australia for diverse purposes ranging from pulpwood and solid wood production, oil production, through to environmental plantings for diverse purposes such as carbon sequestration, salinity reduction and mine rehabilitation (e.g. Byrne 1999; Harwood et al. 2007; O'Brien et al. 2007; Lee et al. 2010; Lee et al. 2011; Bush 2011; Bush et al. 2011; Hendrati et al. 2011).